Delicious Skin is a brand spanking new Vegan skincare range that has almost completely sold out of its first batch within the first week of launching. I am one of the lucky few who was gifted the whole range of products to trial by the lovely creator Nicola, and I am so excited to be sharing the results with you all. But first, I have to start by saying that there is no way I would ever promote or review a range that I didn’t believe in. This range is one of the best that I have come across, no word of a lie. 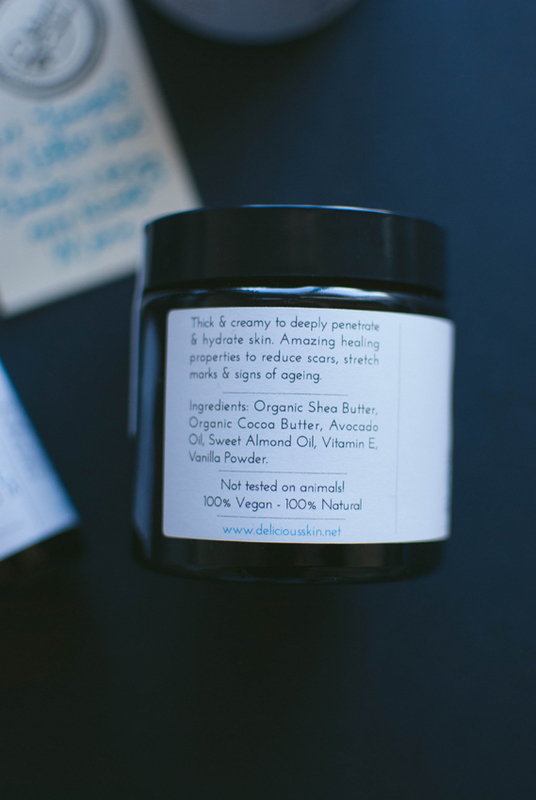 Not to mention it's 100% cruelty-free, Vegan, and handmade using natural plant based ingredients! I started using the products immediately after I had received them, and let me tell you – it was one of the loveliest face washing experiences I have ever (EVER!) had. The cream cleanser is so divine that I could happily use this product to wash my face for the rest of my life. It’s thick yet light, removes your makeup easily without stinging your eyes or tightening your skin, it smells like peppermint cream and leaves your face feeling dewy and lovely. The second product I trialled was the silk serum which is a small vile filled with organic argan oil, organic rosehip oil, & Delicious Skin’s signature blend of essential oils. This is the easiest face moisturiser around; all you need is one small pump of silk serum to keep your face hydrated for hours. The delightful smell is also complimentary to the cleanser, so a combination of the two leaves you smelling deliciously peppermint-y. The deliciously smooth exfoliating mask was a dreamy soft and fluffy texture and left my skin feeling rejuvenated and clear once removed. It is created using natural clays, which actually become magnetically charged when activated to draw out any impurities from your pores. Perfect for anybody having trouble with those unnerving blackheads! After experiencing every other product in the range – there was just no doubt in my mind that the lip salve would be anything less than incredible. I have been using the lip salve daily and it has replaced my chapped, peeling winter lips with the lush, plump kind. To top it all off, this morning, for the first time in my life – I awoke with a face that wasn’t dry OR oily, it was soft and smooth with a dewy like glow. I kid you not; I have never had such incredible results from any skincare in such a short period of time. I cannot wait to see how my skin is looking after a few weeks of this routine.